I got all 10 endings, some of them were awesome, some of them were totally unexpected. Great job! I had so much fun! I kept giving my creatures more appendages and science in hopes that they would stop burning everything down. 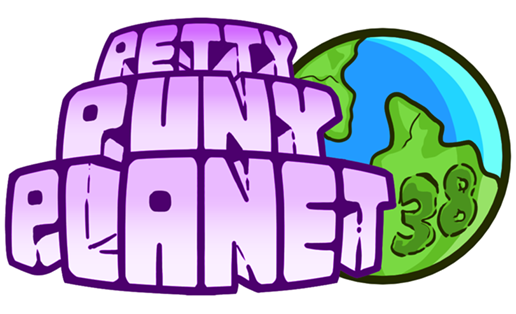 We had a go with Petty Puny Planet 38, and found that it was super fun! We really liked how different the planet would look after giving people something new to play with. The artwork is super fitting and makes me want to play through more times and see all the different combinations. We also made a video of our playthrough. There are many questions in the universe that, not even we, planet overseers, are able to answer. Mysteries that have blinded us over the years that are yet to be answered. Why the 38? We don't know. Maybe the decision that this game should exist was the 38th decision that the planet overseer of our very own planet picked? What about the other 37 decisions? What were they? Are the reasons we have videogames nowadays just another decision made by someone, high there in space? Ah... mysteries, mysteries. On all seriousness, it's a reoccurring gag we have been making ever since Ludum Dare 36 (which was our first game jam), where we decided to add the number of the jam's edition (36) to the game's name (Colossorama) as a joke. When we submitted Colossorama in Ludum Dare 36 it too was originally named Colossorama 36. However, when we updated the game with almost double the content, we figured we would drop the number in order to distinguish it from the original game jam version of the game - therefor just calling it Colossorama. We did the same with Hyper Holomayhem 37. Basically, the number just identifies that the game was made during Ludum Dare 38, and whenever we update the game, we will drop the number. Hope that satisfies your curiosity! I made my perfect world, and anime is now real. Peace does not rain, as everyone is constantly fighting and burning themselves. But it's okay. Thanks for making this. Reminds me of Sort the Court, so with that kind of gameplay you can play it again and again! Thanks a lot for making a video on the game! It was really entertaining to watch and we're glad you got the GameDev Ending! That ending was honestly a last minute addition, but it's still our favorite ending so far. It was really surprising, especially since how close you were to getting the Zombie Apocalypse ending. Glad to see you are that proud of your small ideal planet! As for the resemblance to Sort the Court, yes, it was indeed (and still is) our main inspiration for the game! We wanted something that people could play and try to find all the actions/consequences/endings as they played along, as well as develop something that we could easily iterate upon (which we still haven't had a change to do, but we hope to at some point). Thank you again for playing, and we're glad you enjoyed the game! I had so much fun bossing around my own planet! The text was also really funny. Sorry for the late response! First off, thanks a lot for making a video on the game! We're glad you enjoyed playing the game and Planet Zargoth is definitely sporting some nice dental-planned teeth and Colossorama by the end of it! Congratulations on reaching the 100 Happiness goal you've set as well! We've been commenting this on pretty much every video that been made on the game so far, but yes, we certainly need to tweak the number of times that fires and ice ages happen during the game. But hey, just as you mentioned, maybe they could use your planet as an inspiration for Ice Age 6 (yes, they're making a sixth movie already). Thank you once more for playing and for the entertaining video! You know what? I like moons. This game allows me to do moon things. It is good. But have you gotten the Moon Ending yet? That has to be the best ending possible to a Moon Enthusiast like you! We're glad you liked the game (and the moons too)! why i cant play it? I assume you are speaking about the web version. Depending on the browser, OS and other factors, there might be some difficulties when trying to play the game. If the web version doesn't actually load, then we suggest the best option is really either playing the desktop or the mobile version. We can try and look at what the issue could possibly be, but we would need some more details about how you're trying to run the game (assuming you're playing the Desktop version) or what browser/OS you are currently using. Thanks a lot for making a video on the game and sorry for the late comment (these past few weeks have been crazy)! We're glad you enjoyed in the game overall, especially the different options and cosmetics. It's also nice to see someone going as far as covering three different endings on a single video, pretty sure it's the first time we see someone actually get the Zombie Apocalypse ending on video. Poor second planet which got stuck with endless misery on that asteroid belt though. We've also liked your video it in the Coverage Appreciation post we wrote showcasing all the videos people have made so far! Honestly, this is the best indie management game I've played since Sort The Court! It has humour, a little bit of strategic thinking for the next playthrough and a wealth of fun to be had! Thanks a lot for making a video of the game! It was really entertaining, especially seeing you react to the ridiculous number of times that the Ice Age event occurred. We hope we didn't give the wrong idea with the game's progress though since you've asked your subscribers to help you decide what to do next with your planet, when current planet progress doesn't really save at the time. Hopefully that's not a problem in case you decide to continue the series. Really, thanks a lot for your video! In regards of you comparing it to Sort the Court - it was actually one of the main inspirations for this game! We hope that when we expand upon the concept we can add as much as variety to our game as it! We've also featured your video it in the Coverage Appreciation post we wrote compiling all the videos that have been made so far! Thank you very much for featuring me on your "Coverage Appreciation" page, I really appreciate that! "Your game is honestly awesome! I had so much fun playing it! And yea, I found out after I closed the game down that I couldn't continue off from where I was which is a shame, but next time I get similar options, I'll go for what people asked to see. I really hope your game gets a lot more attention because it absolutely deserves it!"